I recently switched VPS's (to Digital Ocean) and because my new co-location provider does not come with native IPv6, I had to use a tunnel. Naturally I chose tunnelbroker.net. However, after reestablishing all important services, I noticed that TCP ports in the range 6666-6669 don't work -- not on IPv6 anyways. These are usually used by IRC servers. I did a bit of detective work on trying to figure out what was going on. Initially looking for solutions on the internet, but all I found were other people having this same problem with tunnelbroker.net tunnels. I'm doing some IPv6 codig for a client and needed to setup a bunch of 6in4 tunnels. Thre are many ways to do this through distribution init scripts (Debian, Fedora), but I wanted something less permanent and more dynamic for testing. As the dust of the (extremely) well attended Ottawa IPv6 Summit settles, we are working through some post conference tasks. I've just updated the presentation page on the site to include the slide decks of most of the presentations. I am still waiting for files from few speakers. You view the ones which are available on the presentation page. As you may have noticed -- if you were lucky to get in before we sold out -- the talks were recorded. The results of the recordings will go up on our website within a few weeks. Whenever you use the Internet, you are using an Internet Protocol (IP) - a set of rules for communication between computers. Internet Protocol Version 6 (or IPv6 for short) is an upgrade to the most widely available Internet Protocol (version 4, or IPv4). These Internet Protocols are used to assign each computer with an address (called an IP address) that uniquely identifies it on the Web and allows other computers to communicate with it. In the summer of 2010 a half dozen OCLUG members decided it would be a good idea to put on an IPv6 conference for Ottawa. I was one of those people! At the time IANA still had lots of IPv4 addresses, but it was projected to run out in May of 2011. It seemed that no one in Canada was doing anything about it, and people needed to be educated. And so, the IPv6summit.ca was born. Long time no blog... 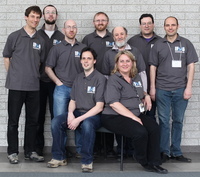 I've been realy busy getting the Ottawa IPv6 Summit off the ground (along with several other people from OCLUG). I'll have to blog about that soon. Anyway... I've also been learning a lot more about IPv6. Which reminded me that I never finished my IPv6 Certification from Hurricane Electric. I stopped at the Guri level because getting Sage (the top level) meant that I would have had to have a sane domain name registrar. I actually registered ipv6summit.ca with BareMetal.com, and so I already had an IPv6 Glue record for this domain. Anyway, long story short... I am now a Sage! Some people have been telling me that they "have no time" or "are too lazy" to setup IPv6 on their desktop, but would like to. Below are 2 easy steps to get IPv6 running on your Debian Linux sytem (shoudl be identical on Ubuntu, and similar distros). If you're not running Linux, check out these pages instead: MacOS X, Windows. If you have an IPv6 Linux network at home, you probably have a Linux host on the perimeter that's running radvd -- this is the server that responds to IPv6 neighbour discovery (ND) requests, distributes the default route to all your hosts, and tells your hosts how to auto configure themselves. All these tasks were handled by the DHCP server, albeit a lot differently, in the good old days. The one other thing that dhcpd did for us was to tell all the hosts where the DNS servers were. So, do I need to run the IPv6 version of dhcpd AND radvd? Apparently there is a huge shortage of Canadian registrars that can provide full ipv6 support. The only one I was able to find is BareMeta.com, which despite it's TLD operates out of Victoria, BC. I haven't switched yet, because while they support ipv6 glue records for .ca, they don't for .net yet. Here is the discussion on dslreports.com where it was mentioned. I've finally gotten onto the IPv6 bandwagon and went through the process of converting my network to IPv6. Ya know, the end is near. I am using an he.net tunnel, and am almost done going through their certification process.